The sun rose at 5:11 a.m. on this, our fifth day of vacation, and the ship was fast alongside Franklin Dock by 5:56. We woke up just after that – we had another early schedule to keep on shore. We were seated on the tour bus by 7:40, and that’s where we met tour guide, David. Keep in mind that our tour guide from the day before had impressed me as one of the best guides by whom I’ve ever been led. He spoke of the area’s history and current physical, economic, and political climate. He pointed out geologic formations and introduced us to past and current issues and thoughts – even literature – relevant to the area. David was not that kind of a tour guide. And we found that out before he even started to drive the bus. Interesting, I thought to myself. He must find it unfortunate for us that we have to wear pink wrist bands. He must find the wristbands to be a tacky tool of corporate tourism. But my speculation was wrong. A moment of quiet followed. “You mean each individual should wear one wrist band?” asked a passenger. David then drove us through Juneau to our first destination, Mendenhall Glacier Park. This being my first, and likely only trip through Juneau, I had hoped that our driver would throw us a few tidbits of information about the local landscape and city. Others in the bus were beginning to speculate that David had been drinking. Finally, we arrived (wearing pink wristbands) at Mendenhall Glacier National Park, and I forgot all about David for the next hour and a half. I had been unsure whether we should plan to visit this park, but I’m so glad we did. We spent a lot of time walking the nature trails, where we saw¬†bald eagles, a porcupine in a tree, and lots of northbound salmon. Some in our group saw a baby bear, but we missed it – although it was clear that bears frequented the area. We saw several recently eaten salmon remains just off of the trail on which we were walking. 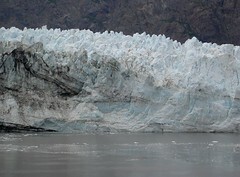 Mendenhall Glacier, itself, was beautiful and surrounded by exquisite pools of clear blue water. We had such a nice time wandering the gorgeous grounds that we didn’t have much time left for the visitor center. But no matter. I’m sure our time was best spent outside. 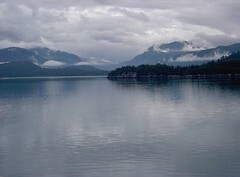 Then it was back onto David’s bus and over to Auke Bay to board a double-decker boat for a three-hour whale-watching trip. 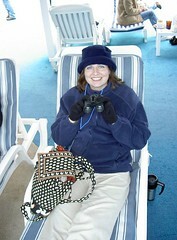 The whale-watching excursion was our favorite of the entire vacation. The first wildlife we spotted were harbor seals. 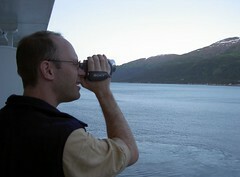 A little further into the trip, we began to see humpback whales – lots of them! We saw several whales diving, spouting up water as they breathed near the surface, and most spectacularly, breaching! During a breach, the whale jumps up vertically out of the water and crashes back into it on its side. It was an amazing sight to see – and we were fortunate to see it so many times! We were told that our boat’s crew had only seen breaching activity on twelve other days this summer – and they sail every day. We met a family of Wisconsinites, first at the glacier, and again on the whale boat. They live not far from Milwaukee. The man we spoke with most owns a restaurant there – one that features “German Night” on Tuesdays. We exchanged information and promised to eat there soon. David picked us up after the whale-watching and had a hard time counting the number of passengers on board. Apparently working on their own theory of David’s behavior, some other passengers asked David if it was his birthday. It wasn’t. But David found the question as amusing as we found it perplexing. Given David’s poor guide skills, I had already decided that we should probably not tip him for his services. But as David drove us for the last time that day, he attained such great form as a bad tour guide, that I gained a whole new respect for him. On that last stretch, he pointed out to us (not that we would ever need to know) both the first and second most expensive gas stations in the town (“but you can save three cents a gallon if you join the club.”) He pointed out the road down which his sister lives, and generally provided other info of absolutely no practical value to visitors, whatsoever. He was telling us the kinds of information that you would tell your visiting Uncle Louie, on his third day in town, after¬†everyone had already run out of things to say. Observing this, Paul and I became positively mirthful at how good David did bad. With each new impractical observation he offered up, we laughed even harder. We parted ways with David as he delivered us to our last on-shore event of the day – an outdoor Salmon Bake. And we ended up giving him an extra large tip. I decided that the poor guy had lived a little too hard in the 60s and 70s and could use a couple of bucks. Besides, we hadn’t laughed that hard in a long time. The Salmon Bake was great. We ate delicious salmon, grilled over an alder wood fire. There were various side-dishes available. We ate near a British couple as we listened to a folk singer. After eating, we roasted a couple of marshmallows around a fire, and then walked along Gold Creek where we saw more determined salmon, up to that old swimming upstream thing. There was a substantial waterfall there, too, and we were SURE that the salmon wouldn’t be able to make it over such a barrier. But a local there assured us that they did, and looked at us like we were a little odd for doubting it. Finally, we took the “salmon bake special” bus back to the port in Juneau. We popped inside the Red Dog Saloon for a few minutes before heading back to the ship. That night, worn out from our two days of on-shore exploring, we dined at Sabatini’s, the Italian restaurant onboard that serves a 17-course meal! Each course was very very small, but I was still¬†so full at the end that it was hard to walk back to the room. The sun set that evening at 8:53 p.m.
We got off the train in Canada, where our trusty bus driver, Jonathan picked us up and¬†took¬†us, on the Klondike Highway, to the¬†Yukon Suspension Bridge – a¬†bridge¬†completed only this year¬†and suspended over the churning rapids of the Tutshi River.¬† The view was lovely, and there were outdoor museum-like interpretive displays.¬† Paul found it odd that it was a destination in the middle of nowhere,¬†but I enjoyed the stop.¬† We took pictures and video of each other walking across the bridge. The sunset was at 9:05 p.m.
Our third day on the ship, and our second day at sea, was spent cruising around beautiful, chilly Glacier Bay. The sun rose at 5:12 a.m. I was up sometime after 6:30 to check out the scenery and the naturalist’s on-board announcements again. We could tell that we were supposed to be taking the opportunity to see glaciers very seriously. The atmosphere on board at mid-day was more sober and dignified. Even the casino was closed, and there were no signs to be seen for Jackpot Bingo. Our ship picked up some National Park Rangers who boated up alongside. One of them gave a nice presentation on the bay (and we attended) in the Princess Theater at 11:30. Now, I don’t think there was actually any element of a genuine cookoff involved here. I didn’t see any sign that any passengers or crew actually submitted competing recipies for any of the dishes served. But no matter, the Rockfish Chowder I tried was tasty and warm. And I was even able to wash it down with a glass of heated Gluehwein, which always makes me think of Berlin. Paul’s video efforts, meanwhile, paid off. 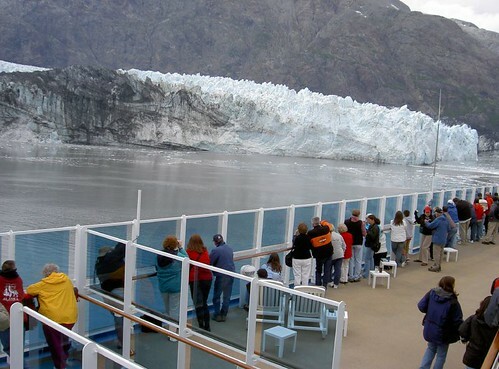 He ended up getting footage of a fantastic glacier calving – the oohs and aahs of fellow passengers included. Finally, it was time to reverse course and head out of the bay. The scenery remained lovely to look at well into the evening, but the more frivolous aspect of the cruise experience returned with full force. By this point in the trip, we were relaxing so genuinely and entering a cruise-induced state of consciousness that was willing to suspend rational skepticism. For a while there, we actually entertained the belief that we were only a few moments, and a little bit of determination, away from having an encounter with a movie star. The Crooners Martini Bar section of the Princess Patter invited us to try “Today’s Martini of the Day – the Mini Mi Martini: Meet the real ‘Mini Mi’ in the Bar.” I held on to the belief that this ship had paid Mini Me, the actor, to come on board just to amuse the likes of us and to promote their drink special. I didn’t snap out of the cruise-induced delusion until my questions about the little guy were greeted with the confused smiles of the non-native speaking bartender on duty. In our leisure, I took time to sneak into our originally assigned stateroom, A209.¬† Just as I had thought – the balcony door was broken, and was being repaired by workmen when I looked in.¬† It was identical in layout to our “upgrade” room, B437.¬† But I liked the B437 location better, so I decided to play along with the “upgrade” narrative, however inaccurate. We then headed over to the Internet Cafe, as we had already become accustomed to doing, to check up on our little daughter back home. Before and after checking e-mail, we used our good manners by using the anti-bacterial hand gel there for that purpose. I was very impressed, throughout the trip, at low-key but effective way in which such hygiene was promoted, and that the well-publicized evil noroviruses were kept at bay. Hand washing was frequently, almost subliminally, recommended through a variety of media. And anti-bacterial gel was widely available, and occasionally mandatory, as I learned one day upon entering the buffet line. As day 3 wore on, we stopped into the 3:30 – 4:30 p.m. Afternoon Tea in the Bordeaux Dining Room. There were some self-important duds at the table where we were seated, though, so we drank our tea, sampled a couple of treats, and retreated to the sanctity of our cabin. 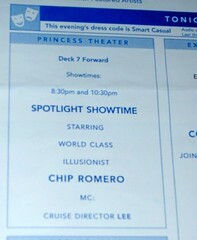 That night, we took in a show in the Princess Theatre by “World Class Illusionist CHIP ROMERO.” He levitated a girl. She didn’t seem to know how he did it, so that was impressive. We fell asleep knowing that tomorrow would be our first exploration of Alaska land proper. Sunset was at 9:05 p.m. The Princess Patter delivered to our room the night before let us know that the sun rose at 5:45 a.m. on day two of our vacation. I rose before 0700hrs (thanks to the alarm clock I had set) to a wonderful view of the smoothed, snow-covered mountain peaks and glaciers of College Fjord gliding slowly by. 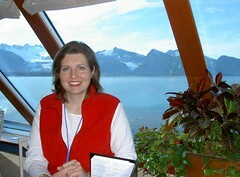 Shortly after I discovered the lovely view, I realized that the ship’s delightful naturalist, Barbara Bennett, was providing live commentary about the Fjord over the PA system. I turned on the in-house TV channel (which also transmitted the view from the live camera at the front of the ship) and listened to her commentary while taking in the scenery out the window; a guided-tour in the privacy of our own room! We were slowly assimilating the nautical culture in which we were immersed. I reminded myself that both “port” and “left” have four letters, and made a point of observing that our cabin, to the right of the ship’s stern, was on the starboard side. We discovered that the cruise staff had left two “Happy Anniversary” baloons outside our door. We brought them inside the cabin to give them a proper home. As soon as Paul returned and clean up from his run at the gym, we headed off for our second encounter with the Horizon Court Buffet. We had opted for “personal choice” dining, so weren’t required to eat at specified times or tables. We sat at the very front of the restaurant at the stern of the ship. 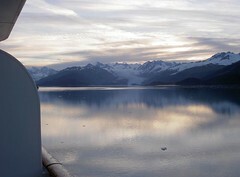 Our seat for breakfast that morning afforded us a lovely 15th-story perspective of our trip out of Prince William Sound. After we finished eating, it was time to tackle planned on-board activities. Paul headed for the Casino to participate in free 10:30 table lessons. I headed to the aft part of the ship, to the Universe Lounge, for my first Morning Jackpot Bingo session. To kill time before the Bingo game began, I continued reading the cruise-related essay I had started the day before, on the flight to Alaska. When a writer recommends another writer to me, I figure it’s worth a try. So I was indulging in the enjoyable title essay of a recommended David Foster Wallace book called, “A Supposedly Fun Thing I’ll Never Do Again” (Thanks, John.) The cynical essay recounts a journalists experience on a 7-day cruise ship and often caused me to laugh out loud in public. The journalist mentioned becoming “strung out” on Snowball Jackpot Bingo on his cruise, and that was part of what inspired me to try the game. While reading my essay in the Universe Lounge, I was aware that those seated, also waiting, near me were mostly retired ladies. They engaged in conversation about the fact that, back at their retirement communities, there just aren’t enough Bingo games offered. And then, I was corrupted. I put down my book to chat with the ladies around me. One of them confided in a conspiring tone that I should really try the “Chocolate Banana Drink.” That was an alcoholic drink, mind you. A light bulb went off for me. I was on vacation. I was about to play a trivial game like Bingo. Why not treat myself to a little alcoholic beverage while doing so? So I ordered a “Princess Colada” and my relationship to the game of Bingo changed and improved forever. Before the Bingo game ended, Paul arrived to discover me mid-Colada. Bad never felt so good. He had earned a $5.00 Casino chip for participating in the table lessons (he ended up learning about 3-card poker, roulette, and “let it ride”). Naturally, we had to stop by the casino, after Bingo, to use the chip. I hadn’t packed my purse to be prepared for gambling. But Paul gave me $10.00. Somehow, luck was with us, and in under 10 minutes, we left the casino $64.00 dollars richer! I had turned Paul’s $10.00 into $32.00 in some $.25 slots, and Paul had won $44.00 at a table. The temperature at noon was 57F. After lunch and a little relaxing, it was time for our treatments at the Lotus Spa. Dinner that evening was a “formal night.” So we cleaned up into some spiffy duds after our massages and ate at a lovely table for two in the Bordeaux Dining Room. At dinner, we submitted our certificates for a free bottle of wine (courtesy of our travel agent) and for a special anniversary dessert (provided by the cruise line), and settled in for a romantic meal. That’s just when the Annoyingly Bilingual Couple arrived and was seated right next to us – just a few inches away. I couldn’t believe our bad luck. We spent the next several minutes listening to the mystery-language and English used in maddeningly rapid succession. Then our anniversary dessert arrived. The waiters rearranged the table to make room for the cake and to position our hands, one on the another, just in time to loudly sing Happy Anniversary to us. It was a little embarrassing. But at that moment, I made sympathetic eye contact with the woman of the Annoyingly Bilingual Couple. Suddenly, she wasn’t as annoying anymore. 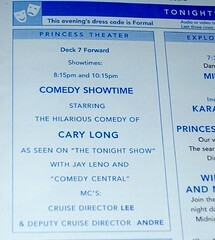 After dinner, still in formal dress, we headed for the Princess Theatre to catch a very funny comedy performance. Relaxed from the wine and the good laughs at the show, and still heady with confidence from our casino wins that morning, we headed back for some some gambling. I had even started to feel better, by that hour, about having spent the money on the expensive algae-detox powder Regina had sold me. It occurred to me that by the end of the week, I could win enough in the casino to cover the cost. That was not destined to happen, however. Although Paul continued to do well at the tables, the losing streak that would haunt me for the rest of the night began that evening. 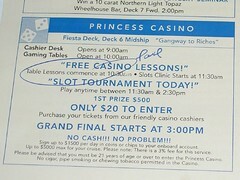 I soon switched to the $.01 slots to lesson the pain. Sunset was at 10:02 p.m. that night. The date was August 7th. It was also our 7th Anniversary. And although it was a Monday, I didn’t have to go to work. 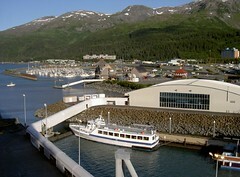 We were leaving for our long-anticipated cruise to Alaska! I was up at 4:50 a.m. to ready myself for our 6:30 a.m. flight. We live near the airport, and Paul was confident that since “this is Milwaukee!” the airport wouldn’t be very crowded at that hour, and we didn’t really need to be there so early. After packing our two cats into crates (they would be picked by my mother a couple of hours later, by pre-arrangement, and taken to the vet for boarding), we got our bags into the car and hit the road. Unfortunately, our time on the road stretched on longer than planned. It took a while to get from the remote lot to the main terminal on the shuttle. When we got to the airline check-in desk at 6:04, we were told that we wouldn’t be allowed to board that 6:30 plane. Too late. Too bad. After paying to confirm seats on the next available (9:15 a.m.) flight, we headed for the airport Starbucks and I headed for a breakdown. I had planned every detail of this trip so carefully. I had packed a full two weeks early! I had been counting on a 6:30 a.m. departure to Minneapolis, and the prospect of arriving more than two hours later than scheduled to our ship, despite the most thoughtful planning, struck me as injustice. I harangued Paul with all manner of impersonations of him saying “this is Milwaukee – we don’t need to be early!” I accused him of having no feelings for me. I even cried. What amused unshakable Paul throughout all this was the fact that, in our regular, as opposed to our vacation lives, I and I, alone, am the one who causes our collective punctuality problem. During the course of our discussion, it became clear that, while I’m in no hurry to beat the clock in the workaday world, I take vacation very seriously, and want to be early for all recreation activities. Usually-punctual Paul, on the other hand, regards vacation as the only time that he can let go of the clock. To him, it makes sense to be late on vacation – there’s no need to be anywhere, really. And that’s when I realized… As a couple, we are simply destined for lateness. I’ll make us late 99% of the time. And just when we have the chance to get away and I reform, Paul will step up to execute the tardy tendencies. In the end, I admit, the delay worked out fine. It gave us a chance to grab some coffee and share a scone. And I even had time to appear productive by reviewing a few documents I’d brought along and sending two or three related e-mails to the office on the blackberry. The flights from Milwaukee to Minneapolis and from Minneapolis to Anchorage were pleasantly uneventful. Since I was on vacation, even the young toddler boy who cried a horrible cry on the first flight (unfairly, I even wondered just what his parents were doing to him) didn’t bother me. In fact, I enjoyed the crying, because making it stop wasn’t my responsibility. I felt a little sympathy for the parents. But not too much. 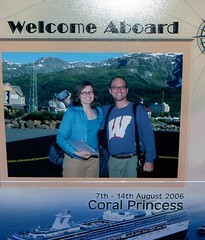 Mostly, we were just happy to finally arrive in Anchorage, Alaska! It was our first visit to the 49th State. After retrieving our bags, we were escorted by Princess representatives to a holding area where we spent a few minutes waiting for the next bus to take us on the 45-minute drive to Whittier. Just after we sat down to wait, a couple that would later inspire in me both loathing and, eventually, respect sat next to us. We would later secretly dub them the Annoyingly Bilingual Couple. My first impression of the pair was that he was either in the mob or was a shady salesman of some stripe. She seemed friendlier, and was certainly the more talkative of the two. What earned them the annoying adjective was the fact that they constantly switched mid-sentence, in their conversations to one another, from an unidentified mystery language to English, and back again. Now I’m pretty good at guessing what type of foreign language I’m hearing, but these two had me stumped. Maybe it was Farsi. Or Azerbaijani. I’m not sure. But I’ve never heard whatever that was plus English used so fluently. It was maddening to be near, really. And we were near them on the bus ride and through the three-mile-long one-way tunnel to Whittier, too. But no matter! It was time to board!!! As we approached the ship, I knew from my research where our cabin, A209, should be. I got a visual on its balcony as we drove up, and it didn’t look like the other balconies. I wondered if its door was broken. We entered the check-in hanger. There was hardly a line, and before we knew it, we were on our way into the ship. The whole process took only a few minutes, and I was impressed with the efficiency of the boarding process. The only unexpected information we were given on our way in was that our room assignment had been changed to B437. In what I recognize and admire as a sign of good customer-relations training, the desk clerk explained the room change as “there must have been an upgrade!” It was an inspired comment. Instead of dealing with any potentially fussy cruise passenger complainers (not that we would be those, but I’m sure they get plenty), this comment encourages the travel-weary vacationer to do what we did – to just wander off, shipward, wondering… did someone upgrade our room? Maybe someone upgraded our room! And just as our flight fatigue, our confusion about where to go, and the question of whether our room assignment had been altered by a mysterious benefactor were all stewing together to create a dazed look on our faces, a cameraman stopped us to take a picture. 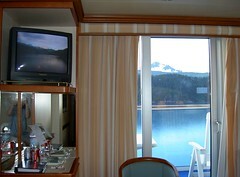 Like 83% of the passenger staterooms on the ship, ours had a balcony. Guided by gracious staff and crew, we soon found our way there. Our room steward, Catherine, was also on the spot to introduce herself to us. Once we picked up the papers waiting for us in the box outside our room, closed, the door, and surveyed the accommodations, there was no denying it. Our vacation was definitely underway! 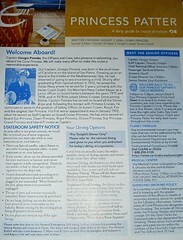 I knew from my research that the Princess Patter would be our daily guide to onboard events and activities. We set it aside to read later, armed ourselves with a map of the ship, and headed off on a self-guided tour. We checked out, among other things, the Princess Links miniature golf course, the Lotus Spa and Gym, the Universe Lounge and Princess Theater. And we noted how very narrow the ship is from side to side. She was designed to be just narrow enough to traverse the Panama Canal, which she does, repeatedly, during the winter months. 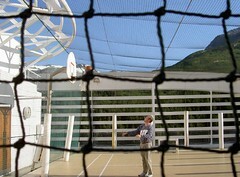 Paul even found¬†time to shoot some hoops on the Sun Deck, Aft, Level 15, before we found our way – it being dinner time, and all – to the Horizon Court Buffet. After a refreshing meal, we headed back to our stateroom to finish unpacking and to start settling in. We waited in our room for the 7:45 p.m. (10:45 p.m. at home) call to the mandatory safety drill. We reported to a specified spot (in the Art Gallery), and practiced putting on life jackets and following orders with a lot of other tired-looking, but festively-dressed people. As soon as that obligation was out of the way, we repaired for the last time that evening to our room. Before we fell asleep, I perused the Patter, and Paul suddenly noticed that we were moving, so did some video filming from the balcony. And so began the cruise that would transport us, along with more than 1940 fellow passengers and 900 crew members, over a distance of 1551 nautical miles over the next seven days. Sunset that evening was at 10:14 p.m., local time, but we were already asleep by then. Woman: Yeah… I took this trip eight years ago and Marjorie Glacier was a lot larger then.¬† It’s really retreated in that time.¬† The icebergs we saw the other day were tiny, too.¬† They were enormous before.¬† It’s all because of global warming.¬† Greenhouse gas and all that.¬† And not like this government is doing anything about it. Paul:¬† Really?¬† Hmmmm.¬†¬†Well,¬†what are you going to be doing in Ketchikan tomorrow? Woman:¬† I’m taking the Hummer excursion. You are currently browsing the archives for the Cruise Log category.